There are two things we never run out of here in Myrtle Beach South Carolina: The sandy beach and lots of fun stuff to do. Myrtle Beach has grown up from the sleepy resort town of decades ago, and is now home to numerous world-class attractions, shows, live dinner theaters, waterparks, amusement parks, and theme restaurants. Here we describe some of the area's most popular attractions and, if available, provide a link to discounts offered by the Myrtle Beach VIP Discount card (we locals use this discount card, too!). The Alabama Theatre is the collaboration of the famous Country Music group Alabama and Gaylord Entertainment that incorporates all musical styles into a nightly show with cutting edge lighting, sound, singing and choreography. It is both a locals favorite venue as well as very popular with visitors who vacation here. Le Grande Cirque at the Palace Theatre is a mesmerizing spectacle of artistry and imagination performed by some of the world's greatest acrobatic and theatrical performers! This show is guaranteed to leave you spellbound and breathless with amazement and wonder. Le Grande Cirque will instantly transform your reality into a world of enchantment and delight! 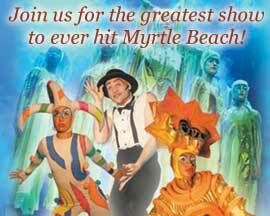 Join us for the greatest show to ever hit Myrtle Beach! Get tickets online at The Palace Theatre. The next time you're in town, don't miss the famed Medieval Times Dinner Attraction. This unique show combines dinner (a four-course feast) at a European-style castle with a Middle Age tournament featuring knights, lances and swords. This dinner show is very original and very entertaining for the entire family or group during your Myrtle Beach vacation. Ripley's Aquarium, located in the Broadway at the Beach shopping and entertainment mecca, is touted as "South Carolina's most visited attraction" and is certainly another adventure you should try to include on your next vacation. The kids can pet stringrays or hold horse-shoe crabs, and the entire family can get close-up views (in a protected clear underwater tunnel) of the rarely seen world of deadly sharks and other fascinating sea creatures. Hourly dive shows are also presented which are educational and entertaining for everyone. Another place locals and visitors like to spend a day is at the only oceanfront waterpark in Myrtle Beach - Family Kingdom Waterpark, located on the beach in the heart of downtown Myrtle Beach. This park provides a full day of fun for entire families, with water fun ranging from a 400-square-foot lazy river for a more relaxing time, to eight kiddie slides for younger family members with energy to burn. Want to see more? 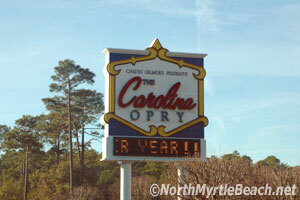 You can also watch streaming videos of Myrtle Beach area attractions at Myrtle Beach TV dot com.